Yesterday, RTÉ’s This Week had an item about Garda Keith Harrison who arrested a member of the drugs unit in Athlone for suspected drink driving. Garda Harrison claims his career has been ruined by this arrest which, although not reported in the RTÉ report, took place in 2009. 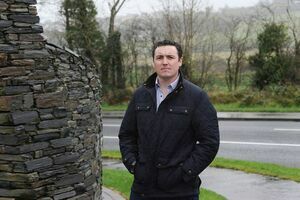 Reporter John Burke explained that Garda Harrison made a complaint to the then Garda Confidential Recipient “two and a half years ago”, before making a complaint to the Garda Síochána Ombudsman Commission (GSOC). Mr Burke said: “GSOC are still awaiting clarification on key issues relating to that investigation which is now running for over two years”. In his report, Mr Burke played an interview he recorded with Garda Harrison’s solicitor Trevor Collins, of Galway-based Kilfeather Solicitors. “My experience, on behalf of my client, is one of frustration in that he brought a complaint, originally to the Garda Confidential Recipient, almost two and a half years ago. Eventually, that was referred to GSOC and GSOC have had this complaint for two years. My client has provided all the information and complied with every request that’s been made of him by GSOC but, much to his frustration, he has been left in limbo for the last two years. Readers may wish to Sinn Féin TD Pearse Doherty’s claims about Garda Harrison in the Dáil on May 15, 2014 – a week after the then Minister for Justice Alan Shatter resigned. On the day that the former Minister for Justice and Equality, Deputy Alan Shatter, resigned, that garda called me and told me that as a result of that resignation he now had more faith in the confidential recipient process and was going to arrange a meeting. That meeting took place today. Both those serving gardaí at that meeting were joined by former garda and prominent whistleblower, John Wilson, who is advising both men. I also invited our justice spokesperson, Deputy Pádraig Mac Lochlainn, to attend which he did. At that meeting I was also presented with a written record of a meeting between Garda Nicky Kehoe and a civilian who has come forward in recent days who corroborates the claims that have been made by Garda Kehoe in regard to heroin dealing and a member of the Garda. Readers may also wish to note a story which was in The Sunday Times yesterday, by John Mooney. The article (above) concerned an internal investigation which, effectively, substantiated some of Garda Kehoe’s claims in relation to Garda collusion in heroin dealing in the Midlands. Readers may also wish to recall separate claims made by another Garda whistleblower, Jack Doyle, about gardai colluding with drug dealers. …[Jack Doyle] watched drugs being taken off boats and gardai supervised the offloading of them. He went to his chief superintendent and told him the story and he was told, ‘oh god, you better go to Dublin with that story’. He never worked for the guards again. I brought that story to the Dáil twice in the last 12 months but it hasn’t, you haven’t seen it because it hasn’t been covered by the media. And there’s a lot of other stories. There’s a number of cases where guards take, they capture drugs. We know of a case where drugs were coming in, maybe five suitcases of cocaine might come in and it would be organised to let four through, the guards would catch one suitcase with some chaps that would be heading off in one direction with the suitcase. Their leader was never caught. And the suitcase they would catch, they would bring it and there’d be a big show and the media would be brought down to show, ‘oh, there was a big drugs find yesterday and here’s all the stuff’. The stuff goes back in a box and fellas have come to us and told us that they were dealing in drugs, they were caught by the cops, they weren’t turned in and the cop says, ‘we’ll be back to ya’. They come back two weeks later and say, ‘here, sell this for us and bring us back the money’. There’s a good bit of that going on. Posted in Misc and tagged drugs, Garda collusion, Jack Doyle, Keith Harrison, Nicky Keohe at 3:14 pm on October 3, 2016 by Broadsheet. I look forward to nothing being done about this. It’s time to legalise the Gardaí. None of this surprises me. GSOC is a waste of four perfectly good letters….. Without them things would be even worse. That’s plainly not the case. 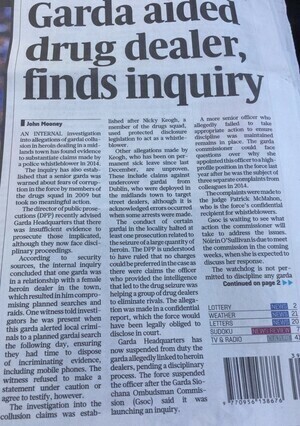 As the Sunday Times report states, it was only when GSOC launched their own investigation did the Gardaí suspend the allegedly compromised detective. No GSOC = no accountability. This weekend the panel on Marian agreed that we all have great faith in the Gardaí. They obviously don’t read the newspapers. Have yous no stories about Kanye West’s missus? for criminal purposes, if so its time to disband the Guards.